@didadi It's supposed to be 28 episodes. But I also agree it's strange that they are different lengths. Not sure what's going on with that. After watching the MV for the ending theme song....I actually think they have just replaced RB's character with CA. As in CA has become RB because the story seems to proceed exactly as the novel does. CBQ has her knew injured while out with her friend etc.. There were a few others but I wasn't paying particular attention. The only thing they seem to have actually added is the hate on CA from that US group. Did QBC and RB go to japan in the novel? I saw that the ratings for ep. 5-6 went even higher than last week, I'm so happy. Waiting for the subs to watch it myself. @mrsyooknit thanks, I'm really glad the drama is doing well. Actually I started watching because of JCW and I didn't particularly enjoy the first 3 episodes, but I started to enjoy it at episode 4. I feel that I could finally relate to the characters' emotions and motivations, and actually started to care about them a little bit. I hope it continues to improve. Can anyone who has read the novel tell us about the 7 mysterious years? I hope Chang An and Qi Bai Cao romance is well done in this second season. They do well together. Her relationship with Ruo Bai was more of being centered around being grateful and respect. They should have just made JCW become RB. Screw the hate YY's fans would have created. Any followers of the novel would have preferred that or even yet, an entire new storyline, compared to what they've done now. I'm not quite sure what the 7 years is considering I've read all the novels and didn't see mention of this *confused*. Unless of course I happened to read the version that everyone else didn't again =.="
I am honestly not that into it. Only keep watching bc JCW but I am glad it is doing well. It think it is going for a younger audience or I guess I just can't connect with the characters. Perhaps it is an advantage ..not having read the novel. I am enjoying the second season more than season 1. Both BC and CA are playing their roles well and the CA backstory gives his character more depth. Was not too sold on to the YY backstory, if there was any. Can totally understand the sentiments of people who were following the novel. But for many of us who cant read Chinese and will have no way to read the novel, i am looking forward to how this builds up. CA has that mystery going for him, with a history that is troubled and there is a reason as to why he is a cold and hard character. It will be interesting to see how he develops and changes with his interaction with his new students. A question.. was CA a character in the novel? or is he a totally new addition in this universe? Honestly, from what I remember CA was a written in character. Although it isn't too much of a stretch to say you can basically pretend CA is RB and you have the novel as it is meant to be shown in the drama xD (just change the injured knee to a heart condition and removal of CA's backstory). @IMOmusings I see your point from someone that liked the novel, but I think replacing Yang Yang would have brought on an incredible amount of hate on whichever poor actor that played Ruo Bai in Season 2. Probably it's just not worth it for any actor to get that kind of hate. I saw glimpses of it on weibo. And unfortunately for YY has a lot of juvenile fans, so it would've cause a great hardship on anyone playing Ruo Bai --- even though YY didn't want to reprise the role again. @Annie Choice Chang An is a character that is not in the original novels. But according to the author, Whirlwind Girl is series of novels, which had many more stories and characters that weren't included in the original. I enjoy Chang An's backstory and his roots are interesting. The marital arts hall he's from is supposed to be the most cut-throat and cruel of all of the halls and only retains the best. As opposed to Song Bai Hall (the setting of the story) they accept whoever loves Yuan Mu Do - whether they have talent or not. There are other Halls with their own characteristics - like the one the Fang siblings (Ting Hao/Ting Yi) belong to, etc. I saw season 1 and although some of the events in 2 may have occurred in the novels with Ruo Bai rather than Chang An, it doesn't bother me. I'd rather not watch a known story - not sure if watching BC take care of RB for episodes on end would make for a good story. Actually, it would be really really interesting if RB comes back at the end and there is some sort of triangle there. True, plot wise, there may be similarities to the novel. But for me, Chang An feels very different from Ruo Bai. Ruo Bai has physical pain but an intact caring family/friends/parents. Also Ruo Bai hides his emotions. But Chang An seems to hide his emotions less - like when he and Ting Hao fight (both times). He seems like a lone-wolf who carries the pain of his past. That's just my guess. Happy watching! @cookiesncream123 xD well considering they did the exact same thing for YY's character in Lost Tomb, I'm just annoyed is all =) I loved the novel for the relationship development between RB and BC. Especially towards the end. I'd rather not watch a known story - not sure if watching BC take care of RB for episodes on end would make for a good story. Actually, it would be really really interesting if RB comes back at the end and there is some sort of triangle there. There are currently rumors circulating that China plans to ban Korean stars from appearing on its television shows due to South Korea’s plans for an anti-missile defense system. Nothing has been announced by the government and the rumors have not been verified, but they continue to spiral. 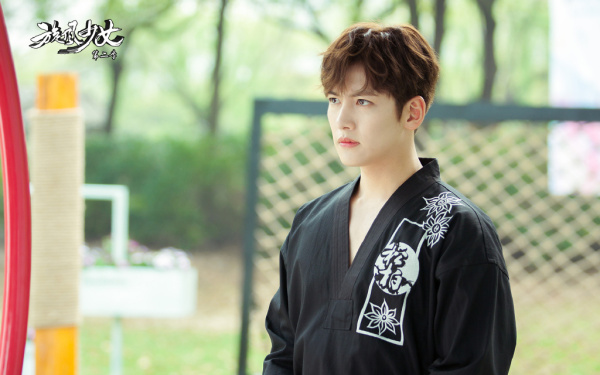 The latest rumor has said that Ji Chang Wook’s new drama has been taken off air by the government because of this alleged situation. “Whirlwind Girl 2” began airing on July 20 on Hunan TV, and also stars Leo Wu, An Yue Xi, and Chen Xiang. @new_breed_asia Good to hear! JCW is 1 actor amongst probably a team of 100 (actors/producers/writer/cameramen/set people/makeup artists, etc. I think China hurts itself it the show doesn't air, because at the end of the day it's a chinese drama on a chinese broadcast station, with a chinese team. It doesn't make sense to hurt so many of your own.